Bron's Blog II: The Second "Storm Of The Century?" The Second "Storm Of The Century?" All week the weather people have been predicting something scary if conditions are just right. Moisture sucked up into NM from Baja, and a major, major low coming down from the Pacific NW. IF the low stays to the north of Albuquerque, we'll just have a rain & snow mix for the next 2 to 3 days. If it swings further south, we'll have a "devastating" storm. At least the kids & I have a 4 day weekend (tomorrow is an in-service day for our school.) We'll be able to enjoy whatever comes our way. I think I said before that it's so simple I'm kinda ashamed to show it to you. I used single crochet through the back loops, staring with 4 chains, then increasing at each end every other row until it was wide enough. 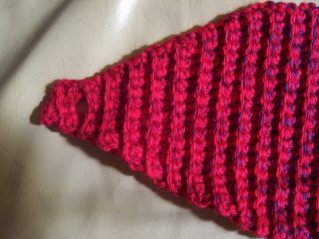 After crocheting about a third of the rows evenly, I decreased every other row back down. At 6 stitches I single crocheted two, chained two, sc 2 for the button hole. The next row was decrease one, two sc in loop, decrease one. One plain of sc & fasten off. See? Too simple for words. 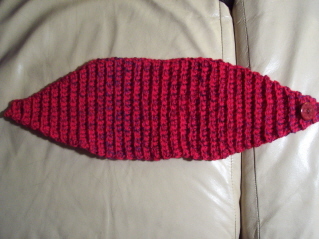 However, this is crochet's easiest version of ribbing and it's very stretchy. You can do ribbing with front & back post double or triple crochets, but in something this small it was a bit problematic. For maximum stretch and size versatility, this was my favorite design. I'm off to sub special ed math today. Classes I've had many times over to it shouldn't be a big deal. The teacher is home after a hysterectomy and her only instructions were: "Chapter 4. Each class is on Ch. 4 in their books." Guess I'll be needing to get to class a little early & figure out a lesson plan for 6th, 7th & 8th grade math! Whew! I hope the "devastating storm" doesn't blow your way. I have special ed class today too-grades 4th and 5th. Cool on the Calorimetry-later I'll have to write down the notes on it. I fully understand the concept, but it's so much nicer having it written out for you. The category feature was the main reason I switched to Typepad (and for the reason you mentioned). I could've fudged the photo albums in blogger, but the categories... had to be Typepad. Now, the new Blogger has labels, so I'm thinking... is it worth the money to keep the blog on Typepad? Other than the photo albums and categories, Blogger offered more. I could mess with the html myself, so the page would look more like what I wanted it to, which I had to give up to move to Typepad. If Blogger quits going down like it has on a regular basis, it'll be hard to justify that extra $ each month. Okay... apparently, I'm rather rambly today. Hopefully you can figure out why the categories aren't working and get that fixed. I'm glad to hear you're feeling better. Yep! The same storm system is headed our way, also. They're sure we won't get any snow. We're more likely to get rain, frozen rain, and/or sleet. Thanks for sharing your crochet version of the Calorimetry. I'm going to give it a try. Wow - another storm! Glad you're feeling better and looking forward to a long weekend! Your crochet Calorimetry is so cute! I liked the crocheted Calorimetry too. I wore my knitted one today. Hey Bron, Long time no comment! When your whole post shows up in Bloglines, it's a bit of an effort to click to your actual blog for commenting - lazy me! Loved your year-end review of your knitted/crocheted items. I actually picked up a crochet hook last night and started a hat - by the seat of my (pajama) pants, I might add (i.e., no pattern). We'll see how it turns out.